2007 Texas Longhorns season preview from Maddux Sports. Below you can find our official Texas Longhorns football preview as well as the 2007 Texas Longhorns Football Schedule. 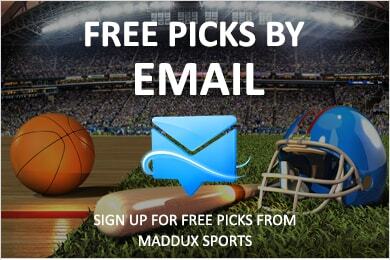 Dont miss our Free football predictions against the bookmakers college football betting line. In 2006, the Texas Longhorns (10-3 overall, 6- 2 Big 12) finished second in the South division and then beat Iowa in the Alamo Bowl 26- 24. In their past five bowl games the Longhorns are 3 -2, including the stunning championship victory against USC 41- 38 to win the 2005 Rose Bowl and take the national championship. How many wins are standard for this team? In the past seven years, the Longhorns have averaged 10 each season. The offense averaged 35.9 PPG, making them 6th nationally in 2006. Sophomore QB Colt McCoy (68% COMP, 2,570 YDs, 29 TDs, 7 INTs) gets the start again. Despite having a pinched nerve that limited his throwing in the final two games, McCoy proved to be smart and talented in his initial year. This season, the Longhorns lack the running power they've had in the past and that means expect more from the air game. The receiving unit is deep and includes athletic senior Limas Sweed (46 REC, 801 YDs, 17.0 AVG, 12 TDs) and dependable junior Quan Cosby (45 REC, 525 YDs, 11.7 AVG, 2 TDs). The frontline lost some important power. Senior LT Tony Hill must lead this new group of starters. Junior Jamaal Charles (156 CAR, 831 YDs, 5.3 AVG, 7 TDs) had a weak season in 2006 and must step-up. Look for McCoy to run more too. On defense, which last season limited teams to merely 18.3 PPG (26th nationally) and 61.3 YPG rushing (3rd nationally), DE Brian Orakpo returns with 4.5 sacks. FS Marcus Griffin (90 tackles, 54 solo) and MLB Rashad Bobino (74 total, 48 solo) return as the leading stoppers. The secondary is worrisome—it was rated 99th nationally in terms of pass defense. The linebackers look good. The Texas Longhorns are the favorite to take their division and the Big 12 Championship. There's a good chance they'll be in the BCS National Championship game. They've been helped by an easier than usual non-conference schedule. For more info on the 2007 Texas Longhorns football program, view the Longhorns website or read up on the rest of the Big 12 ncaa football teams below.